What may give a cat itchy skin around its ear is another parasite, the ear mite. 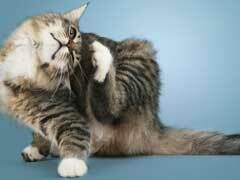 Cat ear mites infect the ear canal, feeding on wax and oils. Their presence causes irritation, scratching, and head shaking. With infection, the mites can bring other forms of skin disease. When dealing with possible ear mites, it’s best to have a vet make certain it is in fact ear mites and not another type of ear infection or skin illness. When a cat has dandruff, this can be a simple issue of dry skin. Try bathing, and then brushing the cat’s fur regularly, and see if that gives the cat itchy skin relief. If it persists, speak to a veterinarian for other possible causes, such as allergies to food or fleas. Even if no fleas are present on a cat, a cat with flea allergies can react to a previous bite long after the flea is gone.